My first entrepreneurial partnership taught me critical lessons about business. My business partner, Randy, was a charismatic, fearless, energetic young man, with giant ideas and the drive to achieve them. His art of persuasion and sales techniques were perfected at an early age and as he discussed his business proposition with me, I recall being completely taken in by his mesmerizing descriptions of how wonderful this would all turn out if we put our resources and energies together. I was all in, no questions asked. Dig a hole to China, climb down the hole, get all their gold and silver, bring it back up the hole and sell it to make kamillions. An onlooker might have thought we had pooled our pennies together and hired a motivational business coach to assure our success. After all, we were doing everything right. We had a business plan. We had commitment. We had the proper tools. We had a clear intention. We TOOK ACTION! We dug that hole in the hot summer sun for several hours with my aunt’s best spoons, refusing to be deterred, even when those spoons bent from the force of rocks and debris in the hole. We had a timeline for success. Okay, perhaps an unrealistic one, as we expected to get to China in that very afternoon, but isn’t that also common of entrepreneurs, expecting success to happen instantly? As far as I can tell, at six, we still weren’t that far off the mark of the average entrepreneur. So far, so good. We had all of the proper mindsets as well. We were not afraid of failure. In fact, FAILURE WAS NOT AN OPTION. We never considered it. Our positive-thinking, created-for-miracle minds had no concept of what failure was. It would be many years before that adult concept took root in our creative minds. We had passion. We had persistence. We had vision, clarity and a goal. We were motivated! We were primed for success! And yet, as you can safely guess, we never made it to China with our bent spoons and best intentions. What could have possibly gone wrong when we followed every single step that all of the coaches tell us to do? Ah…but we did miss one. The same one that so many entrepreneurs miss, over and over and over again, in their excitement and burst of enthusiasm when a new Creative Idea floods into their brain like a crazy-making drug. They forget to do their research. They forget to gather the correct information. No matter how inspired, motivated, well- intentioned or purposeful we were with that business, we were doomed to fail because of the simple truth that there was no path to China under my Aunt Margie’s garden. Period. Nothing, no creative energy, magic mojo, spiritual secret, prayer or rain dance, two thousand dollar seminar or better coach was going to magically help us dig a hole to China. And it won’t help you build your business either if you built your business idea on a faulty foundation to begin with. Do the clients that you have identified as your ideal clients even want what you are selling? Do you know what price the market will bear for that range of services, and have you identified the value you are giving, and if it is a value to them? Is your path in line with your destination? As you can see, ours clearly wasn’t. We could have dug for the rest of our lives, and we were not going to hit our destination. Does your business suffer from the same problem? It’s one thing to have a step-by-step plan. It’s another thing altogether to have done the research to check if it will get you where you plan to go. Is the market over saturated with this idea already? Are you really just now writing a book on Fifty Shades of How to… If so, stop. Please stop. For the love of God come up with something new. Have you asked your existing clients what they want? One of the best tools you already have is the feedback from your existing clients. If you are listening carefully, they will tell you what they need. Their new problems and challenges are where your new solutions and programs are. Your job is to be in the business of solving their challenges. Listen, be there for them, and make the connections when your company can be the one to offer a solution. As a rule, creative entrepreneurs are not fond of taking the time to research and dig for facts. That doesn’t feel creative, fun, spiritual, or feed our souls. However, if we ever want to feed our bank accounts or have food with our meals, the second step after coming up with that brilliant idea is to stop, drop and do your research, before you go flying off to tell everyone about your exciting new adventure. Only after you have built your idea and business plan on a foundation of solid research and understanding of truthful information, can you implement all of those other critically important tools. Then—and only then, can you motivate and set your intentions toward success all the way to the bank. 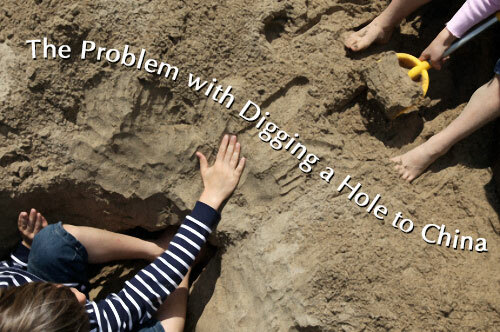 Have you ever been a victim of “Digging a Hole to China” business mentality? Share your AHA’s in the comments below. We want to hear from you! You never know when your comments, questions and insights will be just the thing to help someone else along the way! Dare to care and share! OMG Wendi this is the most hilarious thing I’ve read all week!!! Hahahahaha and so incredibly apt! I love the image of you and your first business partner totally jumping on that fantabulous idea to make “kamillions”! It’s so true that we creative types can get a little carried away… Research is so key. As I found out, if you don’t do the research, the research will end up finding YOU. Dig into those keywords, right?? Thanks for writing this one, really great! I love your comment, “If you don’t do the research, the research will end up finding YOU!” So very, very true! And, creative types getting carried away?? Say it isn’t so! Wendi, you beautifully outlined the entrepreneurial trap so many fall into. Creative ideas do not, necessarily, a business make. Thank you so much. Ahhh, yes, the research. Reminds me of a poor guy on Shark Tank who had been trying, for 12 years to get his product off the ground. The sharks ate him alive. I love your mention of patience too. It’s something I struggle with weekly. Thanks for the great post, Wendi! Oh Wendi! I love this story. The first partnership. I was not expecting what would come next. I think what I experience with the great idea syndrome is the anxiety attack. What comes first and it has to be done now or it won’t get done. Usually that ends up with it won’t get done because I’ve flooded my brain with an insurmountable task of “todo’s”, it just looks like one big pile. So it is easy to do everything but the research. It’s easy to think we know it all because the dream is so big and so wonderful. The real work for me is to consider what it takes to do the work and then decide is it worth my time and effort. It is after all my dream. I can step into it. …consider the work through research and if it’s not something I’m willing to commit to because the task is daunting or unrealistic…I could always step out of the dream and move on to something else. Thanks for the article. It’s great food for thought. Such a great storyline to send us a great message, or messages. I truly appreciate the being patient part. I also appreciate the message of doing research. Sometimes the research isn’t always online, but talking to prospective clients. And, then, the trick is to be able to shift quickly if you’ve discovered there’s no chance of being successful in that area.